UTP7216E-POE-L2 is the managed PoE Ethernet switch, which features 16* downlink Ethernet ports and 4* uplink ports. The downlink ports are 10/100 Mbps PoE Ethernet ports. There are 2* Gigabit uplink Ethernet port and 2* Gigabit uplink SFP optical port. problem of camera power supply. The product provides simple Web management software. There is QOS, VLAN, TRUNK, Spanning tree and other network management features. Transmission distance of downlink port reaches 150M, breaking the limitation of 100m distance on traditional switch and expanding the scope of products covered in actual engineering project. Meanwhile, the use of US industrial Marvell chip ensures the stable operation of the switch. 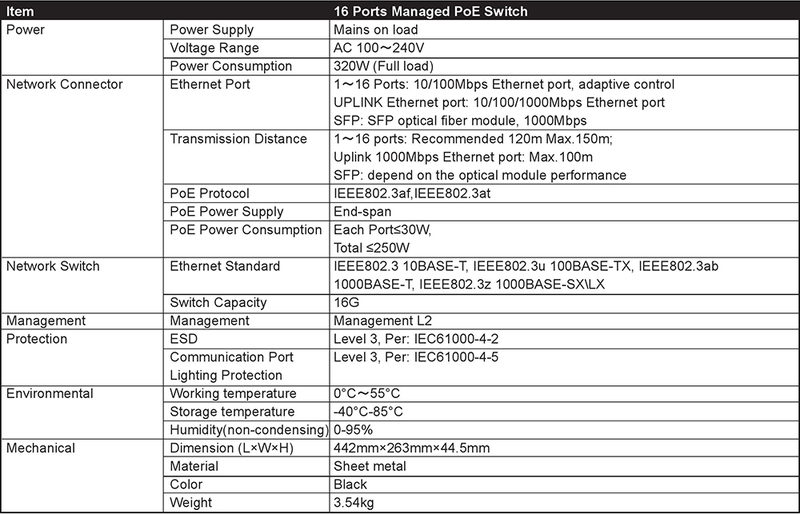 Compared with ordinary switch, UTP7216E-POE-L2 has excellent features and quality. It supports hybrid fiber and Ethernet transmission, long distance transmission of Ethernet port, PoE+ high power supply, simple web management interface, superior lightning protection and anti-interference ability which fit in each complex environment. It is a high performance/price ratio product in the field of HD IP security surveillance and IoT transmission application. More details please download the full catalog.